Although I am someone with a sweet tooth, I've never really found myself going gaga over cupcakes. I have heard a lot of good cupcake stores in the Metro, Cupcakes by Sonja included, but I never understood the joy some people get from munching on these personal-sized cakes. Being a thoughtful sister though, I bought a few cupcakes from Frostings in SM Mall of Asia last Friday as pasalubong to my younger teenage sister. She's a big chocoholic so I got her the premium flavor Belgian Chocolate (P60), along with regular flavors Mocha Cashew Cake (P45) and Double Dutch (P45). 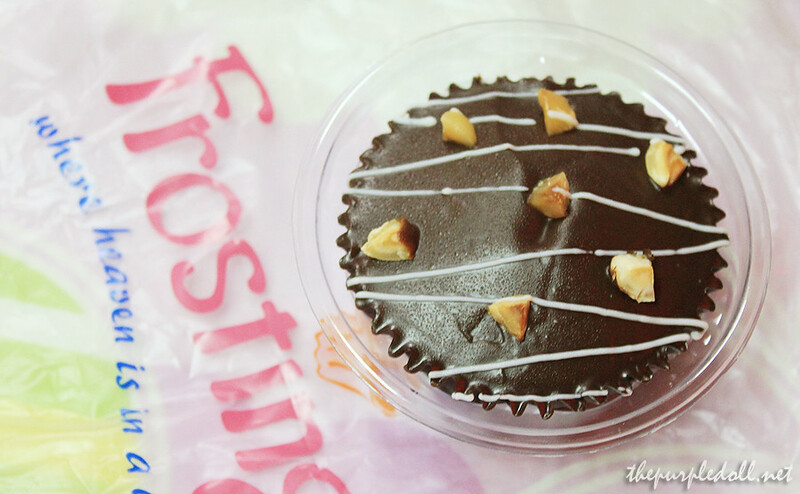 It was interesting how Frostings' cupcakes are packed in plastic cases with a round cover instead of the usual box. They also provide sporks (plastic spoon with fork teeth) along with an order of less than 6 pieces of their cupcakes. By the time I got home, my little sister was already asleep. So I just let the cupcakes sit on the fridge until the next day. Moving on, my sister was excited to try the cupcakes I brought her. It was probably a perfect dessert after eating our lunch. The cupcakes didn't look as good as they were back in the store. And I blame my long commute for that. However, they still look okay and yummy. We (yes, my sister shared the cupcakes with me) first tried the Belgian Chocolate-flavored cupcake, and it was really good! It had a rich dark chocolate flavor with Belgian chocolate bits. The base cake was moist and flavorful on its own, and the hazelnut topping gave the whole cupcake an interesting chunky texture. My sister loved it and has been bothering me to get her more. 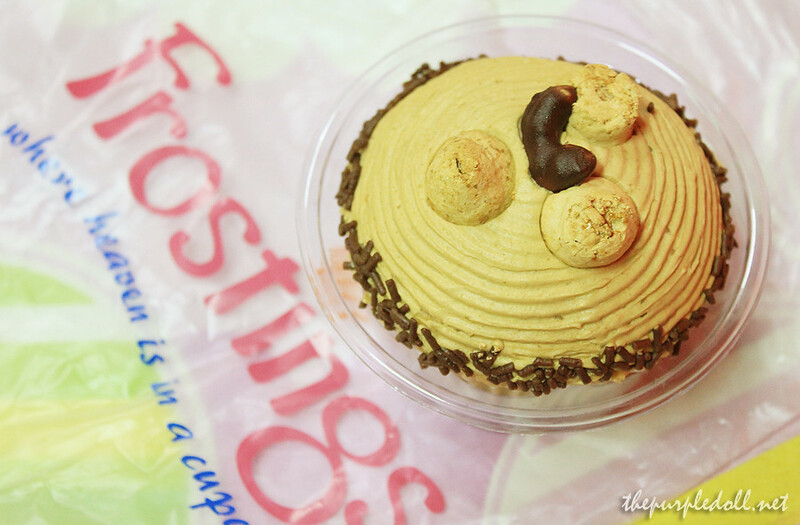 After indulging in a sinfully delightful cupcake, we grabbed the Mocha Cashew-flavored one and immediately sampled it. My sister personally didn't like it that much, saying that it somehow reminds her of Goldilocks' Mocha Cake. However, it was a good mocha treat for me. The base cake is moist and of a rich mocha, almost tasting like coffee. The icing is sweet yet a bit salty, topped with cashew bits -- truly a delightful combination of dessert flavors. After sampling 2 cupcake flavors -- Belgian Chocolate and Mocha Cashew, we had to take a break since eating all of the cupcakes in one sitting is a little too much. Especially for me whose had her tonsils already removed. But immediately after dinner, we grabbed the remaining cupcake from the fridge, the Double Dutch-flavored one. It was love at first bite. The marble cake was so moist and flavorful, more-so its core which was filled with chocolate fudge. The base cake itself was so good that I didn't actually mind the Belgian Chocolate marble icing with choco bits. It was my favorite among the three, although my sister loved the Belgian Chocolate-flavored cupcake more. 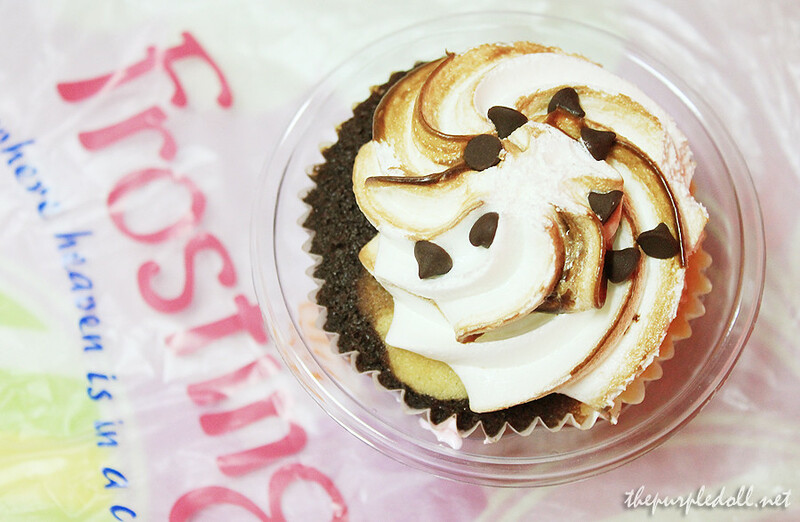 Being a cupcake virgin, I can say that I enjoyed my first time thanks to Frostings. The cupcakes we had were all flavorful and had moist base cakes. Even without the icing, we would still have enjoyed all the 3 flavors we've tried. And at P45 each for their regular line, and P60 each for the premium ones, I say these cupcakes are worthy treats. My sister is now so hooked with Frostings' cupcakes that she even wants them for her upcoming 17th birthday. 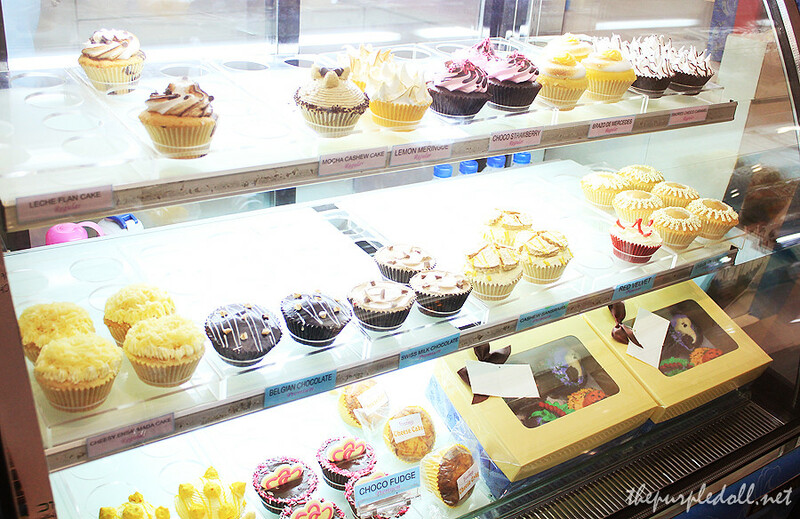 But of course, now that we have become cupcake converts, we'd love to try other cupcake stores. Cupcakes by Sonja, you're next. Ooh, sounds like really yummy cupcakes! Wish we have them here in Batangas. Oh well. double dutch cupcake, just by looking at the picture (before reading your review) for me was the most delicious of the three. Sonja's is the bomb! Seriously! It is oh so worth it. @totomai: Thanks for the tip! I save the raw files on my laptop, SD and flickr. The problem though is I post prod my photos, and they're the ones I put watermark on without saving a copy of unwatermarked ones.. >.< Hopefully I get to buy a 1/2TB external HD for the unwatermarked post-prod images. ayay, those are cute looking cupcakes...likewise, I don't go gaga over them...but I like making and starring at them though...lol! I think there is Frostings in Glorietta. I haven't tried their cupcakes yet, but based on your review, looks like I'm going to try it soon. I would love to try that belgian chocolate cupcake soon! Sis do they have carrot cupcakes? I love looking at pictures of cupcakes on the net, but I really don't enjoy eating them. I'm contented with staring at them.